The silent image captures a lot of things almost at once: the loss of hope and dreams that float away when the innocent child was lost. 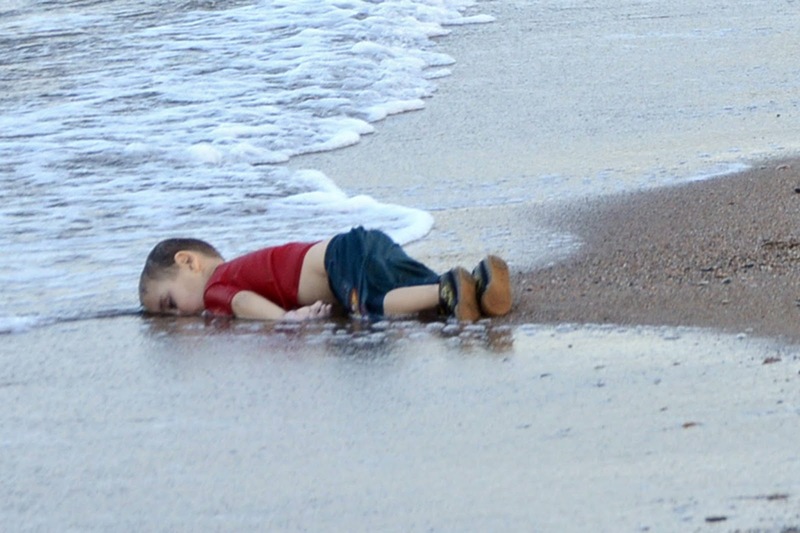 And the well-dressed child with his shoes still on washing up the shores; it was not a ‘poor’ ‘pitiable’ child that died, but a well-loved, cared for child that perhaps had a long bright future ahead. As a father who also lost a child while migrating across the globe, albeit under different circumstances, I can empathize with Abdullah Kurdi's plight. To lose a child unexpectedly, is one of the most heart-wrenching experiences, one that no human should undergo. 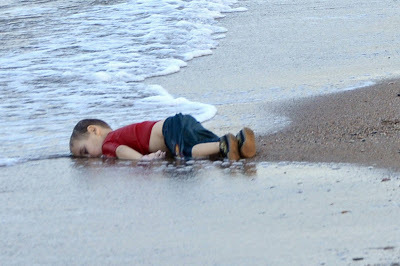 Mr. Kurdi lost not just this child (shown in the image) but his other child and wife too; and with that were perhaps washed away dreams and hope..
Well, Assad hasn’t gone (yet) but a weakened Assad government in Syria has led to a vacuum, one that is filled by ISIS/ISIL. The father, Mr. Abdullah Kurdi hopes to take the bodies of his children and wife “back home” to be buried. Quoting the Reuters article (link), the grieving father Abdullah, states "The things that happened to us here, in the country where we took refuge to escape war in our homeland, we want the whole world to see this. We want the world’s attention on us, so they can prevent the same from happening to others. Let this be the last." The fact that even in this moment of utter grief, Mr. Abdullah Kurdi is able to think clearly is a testament to human resilience. Those of us feeling for the little toddler and hoping for change should take a moment to pause and reflect on the root-cause here: How can we in the west prevent millions of displaced Syrians and Libyans find their way back home?